Flick’s has been long committed to having a great, diverse beer selection. Dozens to choose from, whether you’re look for a keg, a 12-pack, or just a mixture of single craft beers to taste. Flicks has a spirit selection so vast that you’re bound to find a great new product to try every single time you come in. What are you waiting for? Do you have a favorite wine but can never find it anywhere? Here at Flicks, if you can imagine it then we can get it. 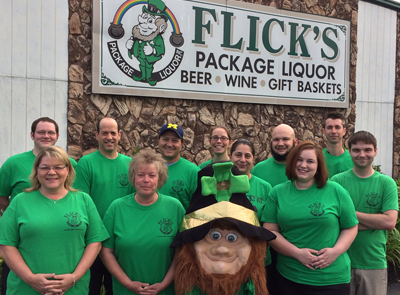 Welcome to Flick's Package Liquor, Inc.
We have been family owned and operated in Bedford for over 65 years, and are open 7 days a week, 364 days a year, all for our customers’ convenience. We are proud to offer an extensive and unique selection of products, our selection is quite extensive and extremely diverse. Featuring just about every kind of alcoholic beverage you can think of, Flick’s also carries the policy of “if we don’t have it, we will see if we can get it for you.” Our staff is not only very friendly, but also very knowledgeable and we are proud to have such a great team, which have advanced us into the most diverse and exciting party store around. Many of our employees have been with us for many years and look forward to making your shopping experience with us the best experience ever. Feel free to call us anytime to ask us about our selection of products or stop in to check out our wide variety of inventory. Items include but are not limited to, Beers on tap with our Growler Fill Station, domestic beer, craft beer, liquor spirits, gift baskets, wine, wine accessories, glassware, snacks, and much more. From my family to yours, we look forward to serving you.